Basic, translational and clinical platelet research has advanced considerably in recent years. A deepened understanding of the role of platelets, mainly in cardio- and cerebrovascular diseases, has led to significant improvements in therapy and significantly reduced morbidity and mortality, but often at the expense of bleeding complications. In addition, recent evidence has indicated unexpected roles of platelets in (patho)physiological conditions beyond thrombosis and haemostasis, such as thrombo-inflammation, innate immunity and host defence, maintenance of barrier and organ integrity, tissue regeneration, and proliferative diseases. However, the molecular mechanisms and therapeutic relevance of these novel platelet functions are largely unknown. Exploring these emerging roles of platelets may finally lead to novel treatment concepts for cardiovascular disorders and beyond. This ultimate goal requires a highly interdisciplinary approach relying on a combination of state-of-the-art mouse genetics, in vivo disease models, advanced imaging techniques, systems biology/omics and clinical research expertise. 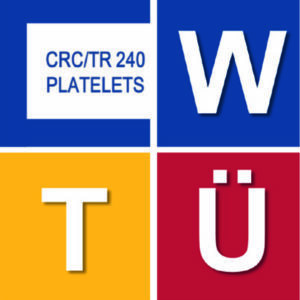 To meet this challenge, the planned CRC/TR 240 builds on two DFG-funded research consortia (CRC 688, CRU 274) whose expertise is complemented by additional partners with long-standing commitment in the fields of platelet/megakaryocyte biology and thrombotic/thrombo-inflammatory disorders. This unique network of basic, translational and clinical scientists will focus on the following complementary fields: (A) Cell biology of megakaryocytes and platelets to understand their basic functions and (B) Platelets as regulators and effectors in disease. We will follow a comprehensive approach starting out from in vitro systems and animal models to clinical research with large prospective patient cohorts and data-/biobanking.